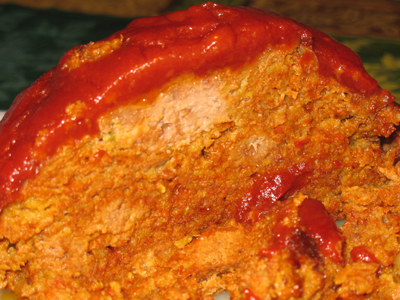 When I was a kid, the idea of meatloaf was just NOT remotely appetizing. Ew. Loaf. Really? Ew. So, of course, my thought is: can we do this in a crock pot? OF COURSE WE CAN. We’ve made a recipe a few times, but it’s a PAIN to clean up. Even lifting the thing out of the crock can be a complete nightmare. In the prior cases, we devised a pair of criss-crossing long foil strips to make a partial basket to lift it out of the bottom of the crock. Of course, seeing as how the bottom of the meatloaf often has the least moisture, it inevitably sticks to the bottom of the crock (no matter how much non-stick spray you use), and even some of the foil stays with it! Cleaning the crock, afterwards, is then a nightmare…which means that this dish doesn’t get made nearly as often as I’d like to eat it. Cue the entrance of the “where have you been all my (crockpotting) life? 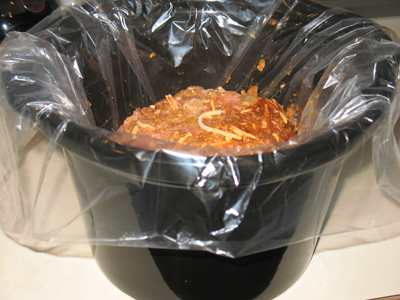 !” technology: the slow cooker liner. As I mentioned in a prior post, dh bought me a package of these for Christmukkah. I figured this was a perfect chance to try one out, and I was EVER SO RIGHT. The moisture content was completely unaffected, the quality of the dish was completely unaffected, but our quality of life from not having to scrub a crock for 20 minutes was VASTLY IMPROVED. Two very happy thumbs up from each of us! And, of course, the meatloaf was tasty. Even better – it had more flavor with the mods I made (which are already included below), to the point where I didn’t add any ketchup to my plate. Double score! Now, the one drawback remaining to this dish is the prep time. I won’t sugarcoat it for you – this is a good 30-35mins of prep. There are also a couple of ways to make the meatloaf extractable from the crock pot, and the steps noted below are a bit lengthier than usual, to accommodate the two methods we’ve used successfully. I covered the bowl with plastic wrap and used a rubber band to keep it all in place, then it went into the fridge. I made the meatloaf the night before I was planning to put it into the crock pot because – let’s face it, there’s just not enough time in the morning to get US out the door with the kids, so adding 30 minutes of crock pot prep time to the morning would’ve been a disaster. My hope was that I could just lift the liner out of the bowl, place it in the crock, cover it and GO. The answer was: YES. This worked out perfectly. In the morning, I removed the mixing bowl from the fridge, removed the plastic wrap and just lifted the liner from the bowl and placed it into the crock. As you can see in the next picture, the liner had excess dangling outside the crock (this is what the manufacturer recommends you do), and then I was able to put the lid on it and just get the crock pot going. The joy of being able to have a fuss-free morning (at least for the crock pot), was brilliant. Even better, clean-up was a breeze, since the only part of the crock pot that needed any cleaning was the lid, and that was mostly just affected by condensation. EASY. And, better still: TASTY. 1. Crush the corn chips – you should have about 2 cups of corn chips once the crushing is done. 2. In a large mixing bowl, combine the turkey, corn chips, cheese, salsa and taco seasoning. Beat the eggs and add to the mixture; combine by hand until you have a fairly well packed mixture. b) If NOT using a liner, I recommend using foil strips to give yourself a way to get the meatloaf out. Liberally coat the inside of the crock with non-stick cooking spray. Get two long lengths of foil (about 2 ft apiece). Fold each lengthwise until you have two foil strips about 2 in wide x 2 ft long. Place them in the crock in an “X” pattern, so that they are perpendicular, with some excess hanging over the top of the crock. This will make a bed (with straps!) for the meatloaf. Then, place the meatloaf in the crock. 4. When the meatloaf is in the crock, cover and cook on LOW for 10-11 hrs. 5. When the cook time is over, add the glaze ingredients to a small bowl or measuring cup and stir to combine. 6. Pour the glaze on top of the meatloaf and then re-cover the crock. Cook on HIGH for 15 minutes. 7. When this 15 minutes is up, remove the meatloaf from the crock and place on a cutting board or platter. NOTE IF USING A LINER: a small amount of grease may have accumulated in the liner and this will end up on your cutting board/platter. 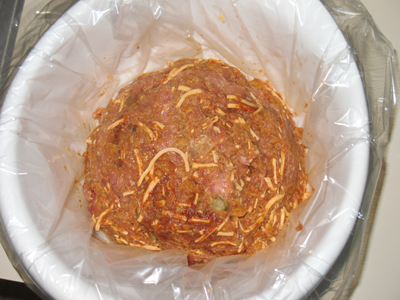 Use a bulb baster to siphon this out before starting to remove the meatloaf from the liner. This entry was posted in crock pot cooking, entrees and tagged crock pot, crockpot by crunchymetromom. Bookmark the permalink.